10 Best Hikes in Washington, D.C. When you think of Washington, D.C., hiking isn’t one of the first things that comes to mind. You’re more likely to think politics, national monuments, and city life. But, truth be told, the nation’s capital is packed with quality trails tailor-made for hiking. There are smooth, flat trails perfect for beginners and families as well as more challenging hikes with hills and steeper pitches that will keep veteran hikers happy. 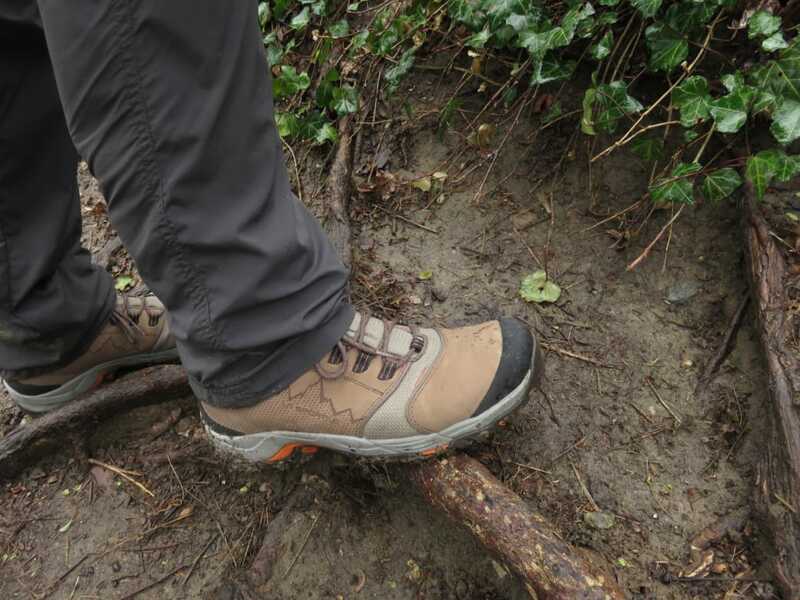 All you need now is a good pair of hiking boots, such as the La Sportiva FC ECO 3.0 GTX (available at REI), and you can leave DC’s urban jungle behind and, instead, enjoy all the nature that surrounds it. Here are 10 of the best trails in the area to get you started. The 2,200-mile Appalachian Trail crosses 15 states on its way from Georgia to Maine. However 544 miles (or one quarter) of it can be found in Virginia, not too far a drive from DC. In fact, in less than an hour’s drive you can find a section of the AT, a little over 100 miles long, that is great for novice hikers. While the trails in this section are well-maintained and a bit gentler than other sections of the AT the views are no less amazing—this section brings you to the beautiful Skyline Drive in Shenandoah National Park. If you are looking for something more challenging, you can head further south in VA where the going is more rugged. This 40-mile Cross Country Trail cuts a north-south line between the Potomac and Occoquan rivers and intersects Fairfax County, a bustling area in the Virginia suburbs of Washington. Much of the trail meanders alongside streams and through the county’s greenspaces, making you feel like you are miles away from the hustle and bustle of city life. The trail is easily accessible with many spots to jump on and off, and it's open to hikers, runners, cyclists, and even horseback riders. The 6,700-acre Patuxent River State Park, just 34 miles outside of D.C., has several miles of remote, unmarked trails for runners, hikers, and horseback riders.The park resides in both Howard and Montgomery counties in the Maryland suburbs north of D.C. The best part about hiking here is that the trails are relatively easy and the vibe is peaceful and serene. It’s a great way to escape the city for a bit. But the remoteness that makes it so great, can also be a challenge. Since the trails are unmarked, it’s important to come prepared with extra food, water, and a hiking partner. Burke Lake Park in Fairfax Station, VA, almost became an international airport before Dulles Airport was built in nearby Chantilly. Luckily, its fate was different, and today it is a family-friendly park with a reservoir—Burke Lake, golf course, playing fields, volleyball courts, and a carousel. The flat 4.5-mile trail that circumnavigates the lake is great place for a run or an evening stroll. It’s a mix of paved and natural surfaces and it snakes around trees and traverses the lake’s dam. Nestled in the Appalachian Mountains of Maryland, Catoctin Mountain Park, home to the presidential retreat, Camp David, has 18 miles of challenging trails with incredible views. Most of the trails start at the park’s visitor center and range from 2.5 miles to 8.5 miles. One of the park’s most picturesque hikes is to Cunningham Falls—reach the falls from the Catoctin National Recreation Trail on the west side of the park. 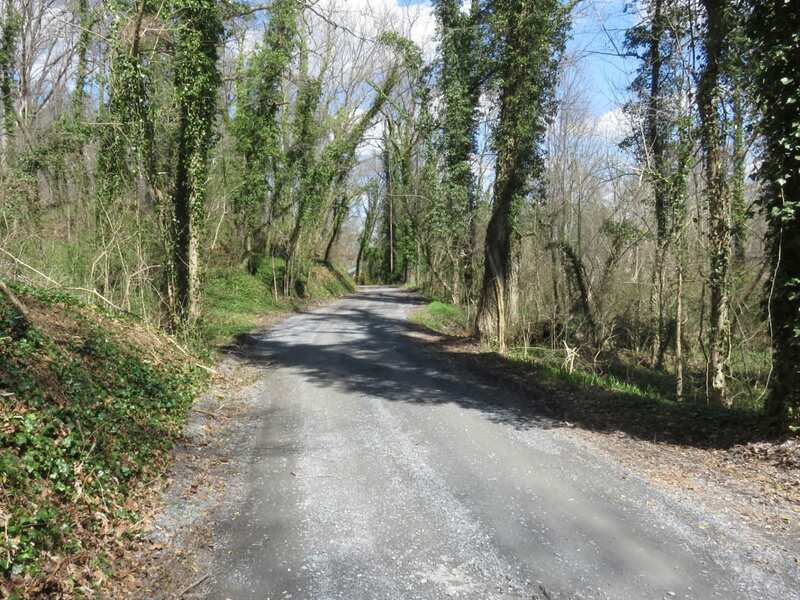 The Seneca Creek Greenway Trail shares real estate with a gravel road at milepost 0. Right outside of downtown D.C. is the 6,000-acre Seneca Creek Park. This park has two sections—the developed area in Gaithersburg, MD and the 16.5-mile Seneca Creek Greenway Trail. In Gaithersberg, there are 11 miles of trails that meander in and around Clopper Lake. 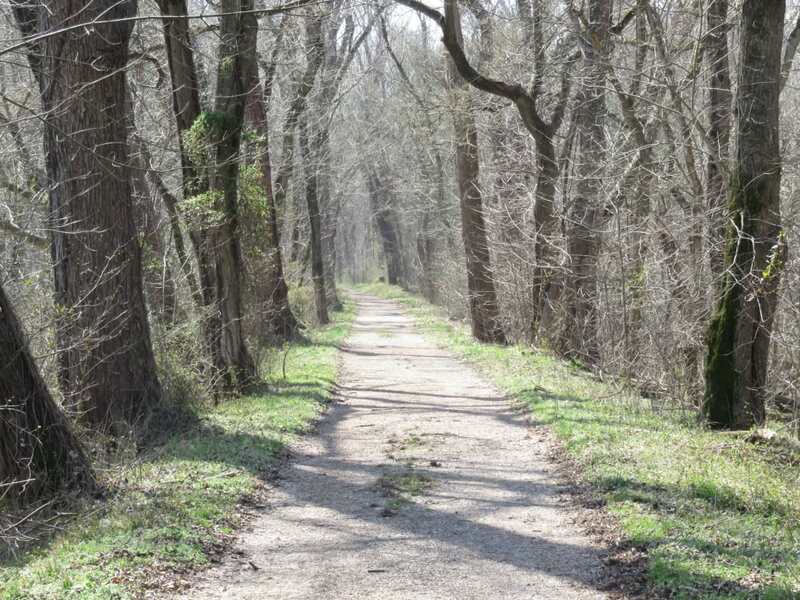 The Seneca Creek Greenway Trail is a winding sliver of land that follows Seneca Creek down to the Potomac River at Riley's Lock on the C&O Canal. Blazed with blue trail markers, the trail cuts a beautiful path through the forest as it makes its way downstream. Sitting just off the Appalachian Trail in the Blue Ridge Mountains of Bluemont, VA is the 66-acre Bears Den Park. A visit here should always include a stop at Bears Den Rocks, which sits 1,350 feet above sea level and overlooks the valley below. In addition, there are four trails ranging from a half mile to a few miles in the park, and they can all be looped together to make a longer hike. The park also has a European-style stone castle on property that was built in 1933—it can be rented out overnight. But, what the park is most known for is its incredible views, especially at sunset—plan your trip to Bears Den Rocks to catch the setting sun there! Follow in the footsteps of George Washington as you hike, bike, and run along the Potomac Heritage Trail, designated a National Scenic Trail in 1983. This 800 plus-mile trail network through Pennsylvania, Maryland, Virginia, and D.C. has 11 trails all steeped in history, from the 18-mile Mount Vernon Trail to the 184.5-mile C&O Canal Towpath. Each has it’s own personality as well, and depending on which trail you decide to explore, you may find yourself in lush dense forest, along city sidewalks, or meandering alongside a waterway. Regardless of which trail you choose, you will find beautiful hikes full of history on any of them. The towpath that meanders alongside the C&O Canal was originally built for mules to pull boats up and down the waterway. The 184.5-mile towpath stretches from Georgetown to Cumberland, MD. It’s a mostly flat trail—there is a 600-foot elevation gain when starting from the Georgtown side— and has a mix of gravel, dirt, and grass surface making it a great spot for a leisurely stroll or to log long miles without challenging hills. Historic Harpers Ferry, WV, played a role in the Civil War, largely due to its strategic location at the confluence of the Potomac and Shenandoah rivers. Today, roughly 20 miles of trails exist in and around this little town. Harpers Ferry National Historical Park sprawls across 4,000 acres of West Virginia, Virginia, and Maryland, and contains the midpoint and headquarters of the 2,178-mile Appalachian National Scenic Trail. The hiking options along riverbanks, across old battlefields, and up mountains have something for everyone. Written by Jason Devaney for RootsRated.